"Sir, this place is dead. Whatever happened here, I think we missed it." Standard video game set-up, particularly for the Survival Horror and Adventure Game genres. Something bad has happened in the setting. Something very bad. The player arrives some time later  days, perhaps, but possibly years, even centuries afterward. Their "official" goal is just to make it out of there with life, limb, and sanity intact, possibly liberating a treasure or two along the way. But in the course of achieving their own goal, they are going to find out a lot about the something that has happened, and the people it happened to. As part of the set-up, the player might have been sent or called specifically in response to the tragedy  to find out what happened, or rescue some one or some thing. Alternatively, they may begin not knowing even that the tragedy has occurred, just happening upon it through bad luck  the classic "Our car broke down so we'll take shelter in this abandoned castle" set-up. Typically, often as a direct result of the player's investigation, they will find themselves needing to learn from what they can piece together of the past to stop this bad something from happening again  to them. In games with a supernatural angle, there will often be some component of "freeing the ghosts" of those involved in the past tragedy by resolving the situation. Expect to find at least one diary (Scavenger hunts for journal pages are very common), a video tape or two, psychic visions of the past, and, very likely, notes on the wall in human blood. This setup is not uncommon outside of video games, but the focus on discovering these fragments of the past is typically much stronger in the game  the interactive medium is particularly well-suited to this kind of storytelling, as it lets the player control the pace and order at which the story is told, but the story itself needs not account for the player's pesky free will getting in the way. It also allows all the storytelling and character interactions to happen non-interactively (often in cutscenes), which actually increases realism, as these sorts of scenes are nigh-impossible to do well interactively. There are some parallels with Ontological Mystery, although typically the characters know how they got there. Super Trope to Slept Through the Apocalypse. Not to be confused with The Cavalry Arrives Late. In the very beginning of Space Quest I: The Sarien Encounter, Roger Wilco awakens in his closet from the sounds of gun fire and commotion as the ship he is on is taken over by the enemy Sariens. By the time he exits the closet, the crew is already dead, the self-destruction sequence is already engaged, and he has to find his way to the escape pod while avoiding the invaders who are still looking for any living souls who they might have missed. In Space Quest V: The Next Mutation, Roger is in command of a starship. One of the planets he visits is supposed to have a small colony. However, no one on the planet is responding to hails, so Roger and his weapons officer Droole beam down to investigate. All they find are abandoned buildings and no trace of the colonists. Then a mutated colonist jumps Roger and tries to infect him with the mutagen. Luckily, Droole shows up and blasts the mutant. A canister found near the colony provides clues as to the origins of the mutagenic plague. Later, Roger travels to the space station, where it was developed, and finds it abandoned as well. The 7th Guest and its sequels. The main character in The 7th Guest is late for a literal party—so late that all the guests are ghosts! It later turns out that he is, in fact, the eponymous Seventh Guest, and was on time, as he, too, is a ghost. In the 1997 Blade Runner video game, the player arrives at the scene of a set of heinous animal murders, and has to investigate the crime, along with several other cases which are shown to be related during the course of the game. Myst. You, the player, find yourself on an abandoned island. After exploring a bit, you build up a picture of something dire that happened there before you arrived. Obduction, by the creators of Myst. You, the player, are whisked away to a human colony on another planet on lockdown. As you explore and unlock everything you find out where all the other humans have gone and why everything is on lockdown. Sierra's own Myst clone, Lighthouse, runs on this trope as well. Professor Jeremiah Krick calls you at the start of the game to come over and babysit his infant daughter Mandy while he's away, but a strange creature breaks in and kidnaps her only minutes later, and Krick himself is nowhere in sight. When you activate a teleporter in his lighthouse, this trope extends to a parallel world, which is almost devoid of life, and an old man Krick met earlier is long dead. AMBER: Journeys Beyond is built on this trope. Your paranormal research partner has bought an allegedly haunted house and rigged it up with all kinds of barely-tested equipment. You find her unconscious with some of that equipment strapped to her head, the whole house dark, and all manner of creepy stuff going down. The Echo Night series uses this in each installment. First one has Richard ending up on the Orpheus, a ship long lost at sea; second has his search for his missing girlfriend lead to a haunted mansion; Beyond takes the series into space and strands him on a lunar colony. Shivers and Shivers Two: Harvest of Souls are both set well after everyone involved is already dead or otherwise cursed. The main story of Eternal Darkness has Alex Roivas trying to discover why her grandfather was killed by reading pages of the Tome of Eternal Darkness he left behind. Several chapters also involve this trope and a paper trail to follow. Most of the Resident Evil games. Resident Evil 2, where Leon and Claire show up to a zombie-infested Raccoon City, takes it the most literally: Partway through, you find the party favors and decorations for a welcome party the Raccoon City Police Department was going to throw for Leon. Notably averted in Resident Evil 6, in China. You're standing right there when the bio-bomb goes off that floods the entire city's streets with zombie gas. You get to watch as the innocent screaming civilians all turn into zombies and begin smashing through windows to devour the people who were indoors and spared from the gas itself in one of the most terrifying game scenes in history. Dead Rising. Frank West enters Willamette to investigate a story...which turns out to be a zombie outbreak. Somewhat of an oddball example, as Frank's mission from the start is to uncover the story. Zig-Zagged in The Legend of Zelda: Breath of the Wild: Link was present when Calamity Ganon began to destroy Hyrule. He would be mortally wounded protecting Princess Zelda and placed into a rejuvenation chamber to recover. By the time Link awakens, he no longer has any memory of what happened, it has been 100 years since he was placed in the chamber, and the near entirety of Hyrule has been laid to ruin. In Nosferatu: The Wrath Of Malachi, the protagonist is late for the wedding of his sister. He arrives at the castle at 10 PM, and has time until midnight to find out what happened. Half-Life 2 has an overarching plotline of the player being late to the tragedy for the subjugation of Earth. There's a nested trope in the Ravenholm portion of the game, where the player walks in on the aftermath of the much more recent slaughter of an entire town. Averted, however, in the first Half-Life, in that the player character directly/accidentally causes the resonance cascade, and all the expansions except Opposing Force put the player as other Black Mesa employees present as everything goes to hell (or technically Xen). Very common in Interactive Fiction, where it forms a subset of the situations described by "Adam Cadre's Theorem" (i.e. That mysteriously abandoned places are common in games since they inherently have mystery and lack any difficult to program Non-Player Characters). Examples include Planetfall, Babel, Glowgrass, Theatre, etc. The Neverhood starts off with the protagonist sleeping on the floor of a locked room with no explanation as to who he is or how he got there. The story is told bit-by-bit through little discs recorded by another character. Downplayed in the Silent Hill series — although fitting most of the criteria, right down to the scattered journal pages and the notes written in human blood, you never really find out what's going on. The most you can hope for is some personal closure, a rescued survivor, or maybe a long-lost wife brought back from the dead. The games do drop hints as to why the town is the way it is, and the nature of Silent Hill is explored in detailed in the expanded book "The Book of Lost Memories". In God of War, Kratos can find several journal passages from the architect who constructed Pandora's Temple. They don't serve to forward the plot at all, but it's very interesting nonetheless. Metroid Prime sets Samus on the planet Tallon IV without any clue as to what happened there, and then does two of these at the same time: the Chozo Lore tells you how things got this way, and the Pirate Data explains what has happened since the original Metroid and what the Space Pirates are doing there. As the pirate entries catch up to the present, Samus becomes the apocalypse. The sequels do it too. Echoes has you landing on Aether in search of a lost platoon of Federation Marines; you find them all dead. You then have to single-handedly reverse the outcome of a just-completed war that had been going on for at least the past several decades. The third game, Corruption, has four instances of this trope: three planets and the wreckage of a battle cruiser. This is at least a bit better than the other examples, as the three planets were recently attacked, and Samus didn't go there immediately because she was unconscious from a previous attack. In Metroid: Fusion you arrive at the BSL research station after a mysterious explosion. Then the zombies show up. In Super Metroid you receive a distress signal from the Ceres Space Colony, only arriving to find all the scientists already dead. Then there is Mega Man Zero 2. Arriving at Neo Arcadia 2 only to find every soldier involved dead (with the exception of one). Star Control 2. The protagonist is sent to aid Earth and its allies in a war against hostile aliens, only to find that Earth was conquered twenty years earlier. Done again later, when you go looking for the Androsynth homeworld only to find out that the Androsynth were researching something they shouldn't have, and were seen by something when they really didn't want to be seen (well, if you believe the Arilou). There are no more Andryosynth, only Orz. System Shock and its sequel, both of which have the hero waking from cryogenic suspension and slowly discovering the ship/station he's on has been through some interesting developments while he was out. Interesting to note is that System Shock's development actually necessitated a Late To The Party story, as then-current computers simply couldn't render believable character interactions. BioShock (from the makers of the System Shock games) takes place in an abandoned undersea utopia-gone-wrong, which the player character stumbles across, discovering more about what went wrong as they explore. Quite literally late to the party in this case, since everything went down on New Years Eve. 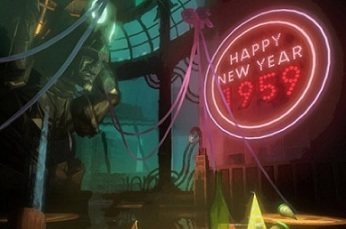 In Bioshock's Alternate Reality Game. In Quain's "Utropolis" manuscript, it details his arrival at Rapture and discovery of the aforementioned New Year's celebration — at which point he muses that he was "Late for the party." In Bioshock 2, there's a subplot of a businessman who stumbled upon Rapture looking for his missing daughter who was turned into a Little Sister told through audio logs. Right before you enter one area of the game, you hear - in the actual world and not an audio log - the man screaming to "get away from her." When you go inside, you can find a suitcase full of surprisingly-normal possessions and an audio log. The audio log ends with the businessman screaming the same desperate pleas you had just heard from outside the room. It turns out that you'd been mere minutes behind him for most of the way. You'd think that'd be the end of that plotline, but right before the finale you're late to the party again, because apparently the businessman didn't die there, and was instead dragged off to become a Big Daddy who would serve his own daughter as a little sister. You find an audio log telling you this directly after you encounter (and let's be honest, probably killed) a Big Daddy with a name matching the businessman from the audio logs, right next to an operating table for the creation of Big Daddies. Averted in Bioshock Infinite, however. Both factions are still fighting, and Columbia hasn't been reduced to the horrific crumbling state of Rapture where everything seems to be hanging by a thread and ready to flood at the slightest provocation. It's still going to be very dangerous though. As Yahtzee put it, "this time, you're just in time for the party, because the party is YOU." In Bungie's Pathways into Darkness, the player is part of an elite special forces team sent with only hours to stop the Sealed Evil in a Can at the bottom of a nightmarish jungle pyramid dungeon from waking up. But your parachute malfunctions before you can land, and your team leaves you for dead. Since It's Up to You, you awaken hours later (also finding that the barrel of the awesome M16 in your Bag of Spilling was bent in the landing, rendering all of your ammo useless) to discover that your team has failed. This occurs a number of times in Final Fantasy VII, usually involving a previous bloody massacre by Sephiroth or the shady dealings of the Shinra organization. This gets ludicrous throughout the middle of Final Fantasy IX, wherein nearly every city the protagonist comes across is obliterated literally moments before he arrives. The list of console RPG cliches actually names this "curse" after the main character — who, granted, was created to bring destruction, but not by arriving five minutes after every plot-related catastrophe. In the Lucasarts video game The Dig, the human protagonists are "kidnapped" by an advanced spaceship and arrive at an alien world whose civilization has apparently become extinct. At first they care only about survival and possibly finding a way to return Earth, but over the course of the game they discover clues as to the cause of the alien disappearance and end up bringing them back. A similar setting appeared in Stanisław Lem's novel Eden. Played straight in Dragon Quest VIII, wherein the heroes often arrive just in time to see their next lead or target go up in smoke. Grout's mansion in Vampire: The Masquerade  Bloodlines is like this: As the main character begins exploring the Malevolent Architecture of the mansion in search of Dr. Grout, they come across tape recordings by the Malkavian Primogen, discussing his condition and history. The further into the mansion you go, the less sane these recordings begin to sound, finally climaxing into some truly epic paranoid rantings that not only turns out to be utterly true, but utterly justified — by the time you get to the inner sanctum, you find his obviously murdered corpse inside. And if that's not creepy enough, wait until you see what he meant by "precautions to protect my beloved wife"—her corpse is sealed inside a huge Victorian belljar, surrounded by objects from her childhood and their courtship. At the beginning of Portal, Chell awakens in a room in Aperture Science. GLaDOS, the motherly computer-generated voice, promises cake and a party if you successfully complete all the challenges set before you. As it turns out, the party she's referring to does not exist (but the cake does...), the employees are long dead, and Chell won't be getting cake... she'll be getting baked. In Portal 2, considering Chell's been in stasis for years (estimates range from two decades to three centuries), she's really late to the tragedy as far as the fate of mankind goes. She's also late to the tragedy she herself set up by destroying GLaDOS in the previous game. And depending on how long she'd been sleeping, things could be either during or post- HalfLife2. Shift, a game which evokes much of the spirit of Portal, uses this trope in Shift 3 . Uncharted: Drake's Fortune does it a few times over - not only the hero and the villainous enemy mercs but also Nazis and Sir Francis Drake were late to the tragedy of a group of Spanish explorers who found El Dorado - and grew to wish they hadn't. In the present, the hero finds himself trawling through the wreckage of these multiple doomed expeditions. Reading Blaster: Ages 9 - 12 does this, frequently incorporating the information about what happened into its language arts activities. Bonesaw: The Game: The Game has one of these to help form its premise. The player character took a bit too long gathering some pulled pork sandwiches, and just happened to miss Ref M sucking the rest of his team into an interdimensional penalty box! Knights of the Old Republic II: The Sith Lords Starts with the player being Late to the Party aboard the Peragus Mining Facility. After finding the culprit, the player promptly has his own party which makes the first party almost completely irrelevant. And the first game had the Hrakert Rift station. You know something happened, but then you and yours walk right into a survival horror mess with a bunch of crazed Selkath, chewed-up bodies, and if you're really unlucky, Darth Malak's excuse for an apprentice. In the first game, the main character is searching for her brother, who disappeared while on a missing person hunt of his own - looking for his mentor, a novelist researching his next novel by visiting the supposedly haunted Himuro mansion. In addition, Miku later happens upon the sad tale of a folklorist who moved into the mansion with his wife and daughter, not to mention the failed ritual that made the mansion so maliciously haunted in the first place. The second game, Crimson Butterfly, has twin protagonists Mayu and Mio getting lost in the woods and stumbling into All Gods' Village, a place that vanished off the face of the earth many years ago. The first section of the game revolves around following the trail of a woman who followed her missing boyfriend to the village. Dead Space does this by the book. You are a literally called in to fix the broken communication system of the mining space ship Ishimura, only to find the crew replaced by hideous necromorphs. Like in Metroid Prime, you can recover sets of video, audio, and textual logs left by various members of the dead crew to piece together how and why the party went down (It wasn't a very nice party). Dead Space 2 on the other hand has you present as the 'party' is starting, although things have been building up for weeks or months beforehand. Dead Space 3 has you arriving very late indeed, 200 years after the first expedition team to reach Tau Volantis. That team was even later, discovering the remains of an alien civilization wiped out millions of years ago. Dead Space 3's DLC, Awakened focuses on Isaac and Carver trying to get back to Earth to warn of the impending party by the Brethren Moons. They arrive, find absolutely ''no'' radio traffic from Earth, and the Brethren Moons showing themselves. In Super Smash Bros. Brawl: The Subspace Emissary, this occurs right before the final boss fight, when Sonic, the fastest playable character in the game, shows up out of nowhere with no notice whatsoever and damages Tabuu's butterfly wings, weakening his 'Off Waves' ability and allowing a battle with him without dying by default. Starflight: You're from Planet Arth, whose star is about to collapse, on a mission to find a hospitable planet to which the populace can relocate. Along the way, adrift in deep space, you find a sleeper ship from Planet Earth... which was rendered inhospitable long ago. So long ago, in fact, that your culture lost all knowledge that your civilization originally came from Earth. Eventually you find Earth itself, and on its surface locate 'artifacts' in the form of newspapers vaguely describing its downfall. Eventually you have to use three actual artifacts together to stop a crystalline entity that was the cause of both Earth's downfall and the near destruction of your solar system. Fallout: New Vegas: In the Honest Hearts DLC, you travel with a caravan through Zion Canyon towards New Canaan, only to find out from the locals that it was razed by the White Legs, who also slaughtered your fellow caravaneers. The Lonesome Road DLC has an interesting twist on this with The Divide, an area that was rendered dangerously inhospitable years before you arrive due to the detonation of multiple nukes buried underneath it. The twist is that you were directly responsible for that, though unintentionally. Those nukes went off in reaction to a package the Courier delivered to the area before the events of the game. Heretic 2 has you arrive at you home town some time after a magical plague has been unleashed. Doom 3 has you both early and late to the party, you're there when everything goes to hell (or hell comes to it) but it's clear a lot has been going on before your arrival. DOOM (2016): Inverted, as the Doom Slayer had already crashed - and torched - the party, then went for a night on the town, torched the town for good measure, then was enjoying an extended stay in the towns drunk tank as a result. In Alpha Prime, your original goal is to simply travel to a sealed off mining station to rescue a friend. Once you meet him, however, you learn that the asteroid was sealed off in the first place due to the Company who owned it's failure to acquire the MacGuffin they sought. By the end, you learn that not only was the villain only there to make another attempt at collecting Glomar's heart while eliminating any witnesses, but it was the real reason you were sent there. The Mystery Case Files series tries out this trope, complete with video Apocalyptic Log, in Dire Grove. A Flash game called Found Lost is pretty much the whole trope. You as the character get lost in the back country on a way to a Halloween party and break down in front of an old house that beckons you in. Some scattered news clippings, a journal, and some scary imagery later, you find out exactly what happened to the previous owner. And it ain't pretty. Halo 3: ODST has the Rookie trying to catch up with the rest of the squad after being unconscious in his drop pod for several hours. The subplot with the audiologs would probably also count. Ghost Trick plays with this trope. Your character is regularly late to any party, leaving someone dead, but his abilities include traveling back to 4 minutes before the person's death, making you catch the party after all. Deadnaut does this on a larger scale - humanity has finally left the solar system in 2115, only to find out that every civilization out there has pretty much died. It is your job to command a crew throughout the ships and find out whatever information you can from dead bodies, and the ship's flight log. Odium. All contact with a Polish city has been lost some time ago. Now, the city is in ruins and bizarre monstrosities roam the streets. There is actually practically no exposition as to what happened until the very end. In Another Code, the protagonist goes to an island to meet her estranged father. She finds out that the owners of the island died decades ago, and her father's whereabouts are unknown. The Golems of Amgarrak DLC for Dragon Age: Origins offers a double dose of this trope. Not only are you exploring the fantasy equivalent of an abandoned laboratory where the researchers were killed by their creation, but you are following in the steps of a previous expedition that attempted to explore the place and were slaughtered. Every level in killer7 amounts to this - the titular assassin group arrives to perform a job, and Travis fills them in on why, exactly, someone has to be killed. In the 1986 Interactive Fiction game Portal (unrelated to 3D series Portal) one-man interstellar expedition returns to Earth after over a century and finds it empty. He uses a computer terminal to figure where did everybody disappear. See also novelization below. The entirety of Alien Legacy involves the colonists of the UNS Calypso waking up from their Human Popsicle state to find that the system they were sent to colonize contains only ruins from the UNS Tantalus colonies (the Tantalus was sent later but had a better engine). Besides establishing colonies all over the Beta Caeli system, the goal is to search the ruins, find the Apocalyptic Logs, and figure out what caused the destruction of the first colonies. The situation is made even more grim, as it's heavily implied that Earth has been destroyed by a vicious alien race (the whole reason for sending out colony ships was to preserve humanity somewhere, as Earth's defenses were being battered down). While many ships were sent out, every captain is given standing orders to assume the worst (i.e. Earth is gone, and so are the other ships) and avoid revealing the location of the colony. In Gone Home you return home after a year abroad and your family isn't there. Something clearly is not right. Finding out what that tragedy was is the point of the game. Happens fairly early in Homeworld. After the first Kharakian hyperjump and battle with the Turanic Raiders, the Mothership returns to Kharak to find that it has just been destroyed by The Empire. The only survivors of your race are aboard the Mothership and several cryo-containers in orbit... which are in the process of being destroyed by a few Imperial ships. After capturing one of the ships, you get the "pleasure" of watching an Apocalyptic Log of your planet's desperate fight against the vast Imperial armada, and the use of an unthinkable WMD against Kharak. In Analogue: A Hate Story the plot begins with a investigator sent to an abandoned and lifeless generation ship to investigate what the hell happened here. The ship's not in the best condition at this point, so there is some danger to the player character as well, though it's fairly low; even if the Mugunghwa explodes you could probably fly away in time. The logs a couple of helpful AIs show you all point to societal degeneration before someone wiped all of the population. It's all fun and games until you discover that one of the AI helping you was the party pooper, and that the ship reactor is very close to exploding, so you have to work fast so the logs aren't blown to bits and lost. In the sequel, Hate Plus, we keep digging and discover how the things first degenerated to the state seen in the previous game. A few Mario games run on this, specifically Super Mario 64. Princess Peach invites Mario to her palace for a celebration or simply to have cake together. By the time Mario arrives, she is already kidnapped. The Elder Scrolls IV: Oblivion: This happens several times, but the most notable instance is a late Mage's Guild Quest, where you are sent to check up on a spy within the Necromancer Cult, and you are outright told "You missed the party- the special guest has already left!" Of course, this means bad things for The Mole. In Mortal Kombat: Deception, Jade wanted to help the heroes fight the Deadly Alliance from the previous game but by the time she gets there the fight is over, the heroes corpses litter the ground and the new Big Bad is just showing up. The indie game Return of the Obra Dinn has you investigating an abandoned ship that mysterious sails into London, and trying to find out what happened to the dead or missing crew members. In stage two of Jamestown: Legend of the Lost Colony, Sir Walter finds the eponymous Lost Colony, only to find it has been devasted by local swamp creatures which proceed to give him a very ballistic welcome. Among the ruins, he manages to find Virginia, the first human born on Mars who is determined with finding Joachim, her father and the only other survivor. Happens several times in the Shepard trilogy, most prominently when investigating the Collector attacks in Mass Effect 2 and during the Sanctuary and monastery missions in Mass Effect 3. In Mass Effect: Andromeda, the Andromeda Initiative studied their target planets in real time using mass effect telescopes before setting out. They arrive in Andromeda 634 years later to discover that in the interim a Negative Space Wedgie has broken out across the target star cluster, and worse, the kett have invaded the place. One sidequest in Rakenzarn Tales is about investigating one of these in the form of an inn where people have been mysteriously disappearing. Fallout 4 has this happen at the beginning of the Automatron DLC, where both Jackson and Zoe have been killed by the hostile robots by the time you find their caravan, and Ada is the only survivor. In Subnautica, the protagonist is present when the Aurora begins to crash, but gets hit over the head and wakes up after every other survivor has died, with their last moments saved in collectible PDA files. Later, it also turns out that Aurora itself was late to a far greater tragedy - a near-total extinction of all life on the planet, and the massive plague that had ravaged the galaxy thousands of years before. This story is told thorugh ruins and the PDA AI's speculations. The Elder Scrolls V: Skyrim: many side-missions and places you can find in the overworld and certain dungeons fully engage in this, and you'll often find the bodies of hapless men, mer, or beastfolk who got on the wrong side of some monster or dangerous animal in the wilderness, or the smoking ruins of a house where you'll find the inhabitants have been murdered by bandits. One mission in particular is starts when you walk into a lighthouse in the mountains, where you find the body of a woman and a chaurus and are immediately given the quest prompt to find out what happened. Another occurs when you happen upon an archaeological expedition into a dwarven ruin and find the bodies of the expedition littered through the whole dungeon as you slowly learn what transpired there. The last two episodes of Neon Genesis Evangelion, with the narrative arriving late and Instrumentality being the party. It probably happened while Shinji, who is kind of an Author Avatar, was sleeping after the end of the previous episode. The second to last episode simply starts with Shinji confronting his own mind in Limbo, after all of humanity has been Ascend to a Higher Plane of Existence. Parodied in the Doctor Who Magazine comic story "Death to the Doctor! ", which ends with the Doctor arriving at an asteroid base strewn with corpses and lamenting that he wasn't there in time to prevent whatever happened happening. In the story the reader has just been laughing at, a group of loser villains who gathered together at the base to plot to kill the Doctor killed each other in paranoia that he was already there. Judge Dredd: In Dark Justice, the Mayflower colony ship hasn't even left the solar system when the Dark Judges make their presence known after having stowed away in a human host. The rescue mission led by Dredd and Anderson can't get there until 12 days later, at which point pretty much every passenger has become a corpse. Rick Grimes' situation at the start of the The Walking Dead, having been rendered comatose by a shotgun blast some time before the dead... well, start walking. There are a couple of points in The Transformers: More Than Meets the Eye where Something Bad goes down on the Lost Light (or, in one case, a duplicate Lost Light), and our viewpoint character misses it: Tailgate misses Sunder's rampage in "Speak, Memory", while everyone shows up late to the "Slaughterhouse" incident. Subverted with First Aid and the Protectobots in "The Plotter's Club", however; they're living through showing up Late to the Tragedy again and again, because Getaway has trapped them in a memory loop to keep them contained. Sonic X: Dark Chaos: When Sonic and his friends leave their world to find the Chaos Emeralds, they quickly discover that the galaxy is a largely ruined Crapsack World devastated by the thirty-year Metarex War, fought over by Jerkass Gods, and nearly wholly devoured by the Shroud. With Strings Attached: The four are sent to C'hou, specifically the continent of Baravada, when its entire (dysfunctional anarchistic dystopian/utopian) way of life is dying out. There are hints of a much more orderly past to the planet, especially the magnificent Ghost City of Ehndris and the implied behavior of the Jerkass Gods some centuries in the past. In the movie 28 Days Later, main character Jim wakes up in a deserted hospital after England has been ravaged by the Rage virus. This leads to a "last man on earth"-type scenario, at least until he stumbles upon some zombies and ends up being saved by survivors who actually know what happened. The first twenty minutes of the film are basically one long homage to The Day of the Triffids in general and the 1980s BBC adaptation starring John Duttine in particular. Ripley and the Colonial Marines in Aliens. Sergeant Apone: Sir, this place is dead. Whatever happened here, I think we missed it. Similarly, Prometheus takes place well after the disaster that killed all but one of the Engineers, though video logs show what happened. Avengers: Infinity War: The Guardians arrive to witness the aftermath of the explosion of the Statesman, with pieces of the ship and dead bodies floating in space. Event Horizon takes place when the title ship mysteriously returns, empty, after killing its previous crew in hyperspace. The Soviet two-part film Moscow  Cassiopeia, humans receive a signal from a star in the Cassiopeia constellation and send a relativistic ship crewed by teenagers to make first contact. The ship finally arrives in the second part and discovers only strange white pillars where civilization used to be. Then humanoid robots show up as well as survivors of the former civilization who explain what happened. There was a robot uprising, with the robots forcibly removing emotions from their creators to make them "happy", resulting in their extinction. The only ones who survived were aboard an orbital observatory at the time. After spending most of the movie being hunted by the Operative, the crew of Serenity travel to the planet of Miranda in search for answers as to what happened there. They find out. And it's not pretty. The alien in John Carpenter's The Thing (1982) got dug up by, and slaughtered, a Swedish Norwegian expedition team before it found its way into the American outpost in Antarctica. Given John Carpenter has admitted to being a fan of H.P. Lovecraft, this could have been based on a scene from At the Mountains of Madness, where the protagonist arrives at Lake's camp only to find it in ruins and everyone presumably killed by the Elder-Things. Angels & Demons has the heroes reaching each of the four cardinals less late each time, but too late to save them nonetheless. In the film version, Robert Langdon actually saves the fourth cardinal. In At the Mountains of Madness, all of the dying happens before the viewpoint characters arrive. In the book Prince Caspian from The Chronicles of Narnia, the characters arrive at the ruins of the castle, and, over the course of the book, discover that Narnia has been overthrown by evil forces and they have been summoned to save it. Classic. In Kir Bulychev's The City Above, the Earth explorers are studying the centuries-old nuked ruins on the surface. Meanwhile Human Aliens struggle to survive underground. A "pipe-worker" fed up with this oppressive life leaves to search for "The City Above" or die trying. The book predates The City of Ember by 3 decades, but resemblance is coincidental. The Day of the Triffids opens with the protagonist waking up to discover he has quite literally Slept Through the Apocalypse. The first couple of chapters, as he stumbles around slowly beginning to grasp the sheer enormity of what has taken place, have been homaged by about half the entries on this page. Empire from the Ashes includes this in each book. First book: "What happened to Dahak's crew?" Second book: "What happened to the Fourth Imperium?" Third book: "What happened to Pardal's techbase?" In Hero's Chains, Derek arrives several centuries late to a world gone from a sci-fi utopia to a fantasy hellhole. Several examples in the Honor Harrington series, due to the interstellar distances involved and the setting's lack of Subspace Ansibles. It's not uncommon for ships to depart a system on some mission or another, and return only to learn that the system was attacked or even captured by the enemy while they were out of touch. In Kir Bulychev's The Last War (from Doctor Pavlysh series), a joint expedition of humans and frog-like aliens goes to a planet whose Human Alien natives have recently nuked themselves into extinction. The frog aliens have a device capable of restoring/cloning a living being based on a sufficiently intact body. The goal is to attempt to resurrect the race and help them rebuild their irradiated and poisoned world (one side used nukes, the other released a poison). In the second half of the novel, they discover that the military junta that has started the war have survived in an underground bunker and are pissed off at the off-worlders for making themselves at home, threatening to launch more nukes if they don't leave. The Lord of the Rings features the famous scene when the Fellowship arrives at Moria and sees that the entire city has been wiped out. Played with in that everyone in the know was already aware that Moria had become a ruin long ago (noted by the fact that Moria isn't even its true name, but what folks started calling the place after Khazad-dûm was razed). What they didn't know was what happened to Balin's expedition to reclaim and restore it. Portal: A Dataspace Retrieval by Rob Swigart is a novelization of the 1986 Portal game above. One-man interstellar expedition returns after a century and finds that humans left Earth. He uses a computer terminal to figure where did everybody disappear. Star Wars Legends: Shatterpoint has the Clone Wars and the Republic at large be late to the "party" known as the Summertime Wars . Basically, conflict between offworlders and natives led to a war that starts when the winter snows melt and end when the autumn rains began. Each year. For thirty years as of the start of the book. The natives only support the Republic because the offworlders are supported by the Separatists. Mace Windu, the narrator, notes that his young native companions do not speak of what they will do "after the war". Because it's all they've ever known. Which makes it kind of heartbreaking when Nick admits his feelings about what he wanted to do with Chalk if the war ever ended, while holding her corpse. In the pilot episode of Crusade, Gideon arrives to Earth days after the battle with the Drakh (see Babylon 5: A Call to Arms). All the crew see are ship wreckage and infected Earth. Matheson comments that they were late for the party even before they jumped. Then again, there's not much they could've done with a research vessel with only enough weapons to scare off an occasional raider or two. "Blink": as told from the perspective of Sally Sparrow, she is learning of actions the Doctor took decades earlier. Which he hasn't done yet. "Silence in the Library"/"Forest of the Dead": the Doctor and companion (and an archaeological expedition) arrive a century after the "event". "Eat Me", an unusual horror episode of Farscape, had the characters arriving on a Ghost Ship infested with cannibalistic zombie-like creatures, discovering the horrible cause of events, and fighting to get out alive. Lost was partially inspired by games such as Myst in which the character finds himself in a strange place with little information, including the objectives of the game. As the characters have explored the island, they've found the abandoned Dharma stations, numerous skeletons, and what was once a large statue, which now has been reduced to a lone foot. Don Eppes of NUMB3RS has been known to complain that being in law enforcement basically entails this. Don: Look, I'm tired of picking up the pieces, okay? It seems like all we do is get there too late. Charlie makes a similar complaint a season later, comparing the FBI to doctors trying to treat car crash victims thrown through windshields (the solution is not to come up with a better way to treat said wounds, but to come up with a means of preventing them, namely seatbelts). He actually tries to figure out a way to prevent crime with math, but is forced to concede that it's too complex a system to be undermined in the way he intended. Power Rangers Ninja Storm begins with our heroes-to-be late for training yet again... thus missing the Big Bad's initial sacking of their training hall. Star Trek: Can you say "Assemble an away team to explore the derelict/ruin"? How about "Jim, this man is dead!"? Star Trek: The Enterprise-D arrives at Wolf 359 after the battle. The fleet it was supposed to join has been destroyed by the Borg. The shot of the Enterprise moving through the burning debris, while Ron Jones' score soars ominously, is haunting. Done in a really tragic way in the Big Finish Doctor Who story "Lucie Miller"/"To the Death". When a plague is sweeping across Earth Lucie Miller sends a message to the Doctor. However he arrives years later, by which time the Daleks have invaded Earth. It is revealed the Meddling Monk was responsible for the Doctor arriving late. Taken to a ridiculous degree in 8-Bit Theater where the protagonists were late to the final villain's defeat when they briefly fled from him and a group composed mostly of characters we've never seen before killed him. Downplayed in Sinfest: Criminy arrives back to find Fuchsia's painting things spread over the ground and no sign of her. But she emerges a second later to tell him of her Flashback. Jay in Marble Hornets begins his investigation nearly three years after the events recorded in the tapes. Most of the cast has scattered or disappeared and several locations trashed by the time Jay looks for them. Averted at the same time though: As Jay starts going through the tapes, it becomes apparent that he had much more to do with the party than he remembered. Star Wars Resistance: In "The Core Problem", Kaz and Poe explore a desolate star system after the First Order has completely wrecked it (Star Killing, coring out all the planets, the massacre of an inhabited moon), but aren't able to find any clues about their motives for doing so before they have to leave. Looks like you were late to the new edit party....Do you want some cake? I baked it. Those monsters don't want it.